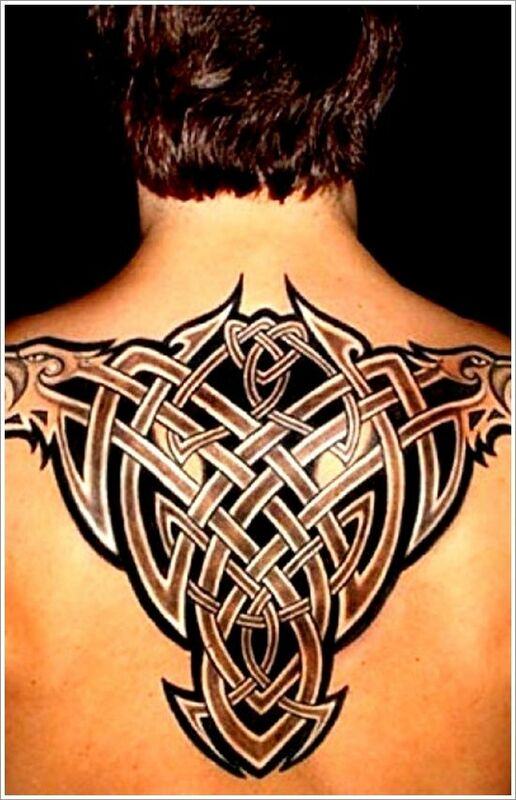 A tattoo of intertwined fire amber that form a charming ball is a sign of boldness in a way that is not scary as witnessed in other men tattoos ideas for bravery such as fire-spitting cobras or human skulls. The intertwining patterns are very cool to look at from a distance. This tattoo describes a fear-provoking woman whose hair is being blown off by wind and has lips that look dry. The woman herself looks scared and is surely another clear sign of bravery for people walking with her tattoo at the back of their body. 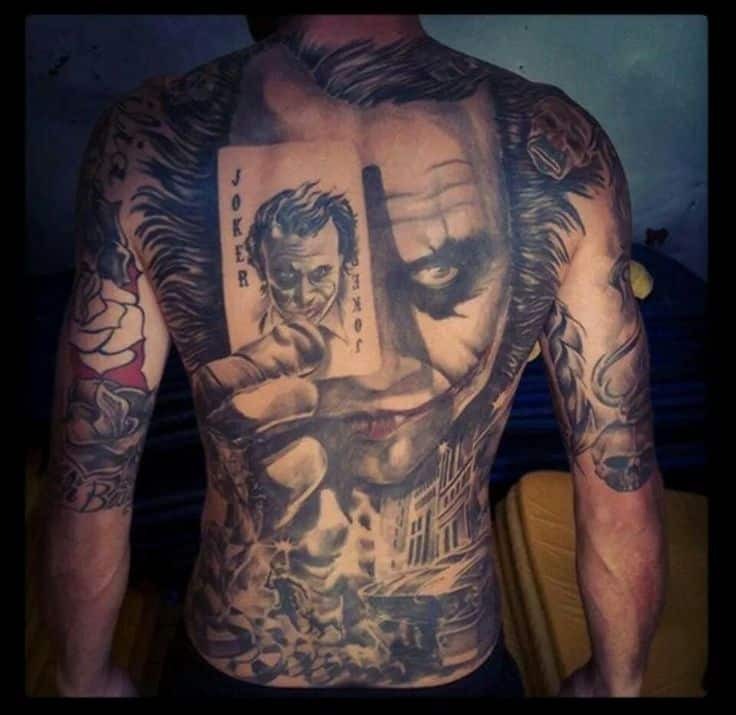 A tattoo of the Joker, one of the scariest movie and comic book characters at the back of your body is a great show of masculine boldness. The scary Joker whose face is partly covered with a playing card that fully blocks one eye is very creepy and only daring individuals can have him tattooed at their backs. 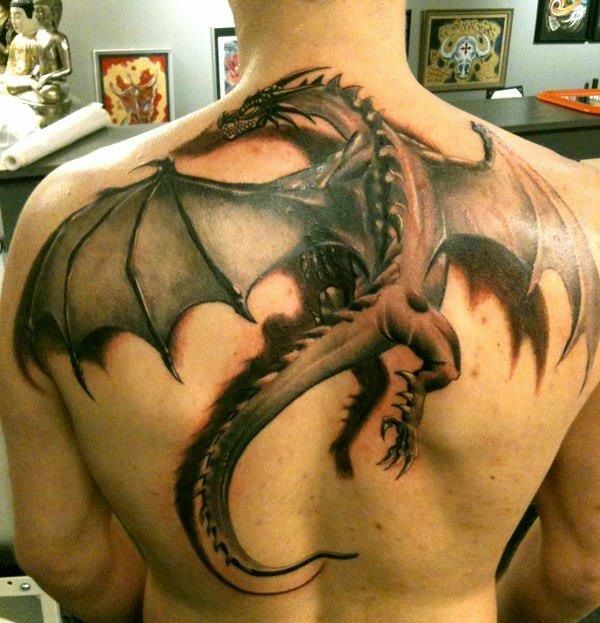 Dragons are some of the oldest picturesque tattoo ideas for men. This seemingly cool dragon is exceptionally different from the fire-spitting monster images popular on Japanese Yakuza tattoos. It is a cool tattoo for someone not wanting a lot of attention from observers. 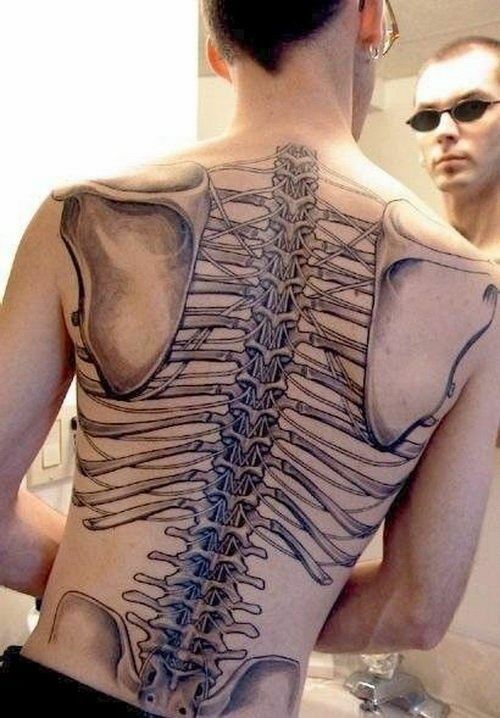 A daring tattoo with the human skeleton, the backbone fully-exposed with ribs projecting outwards is scary and a clear sign of hardiness. The clearly outlined scapular bones make the tattoo look more realistic to viewers. 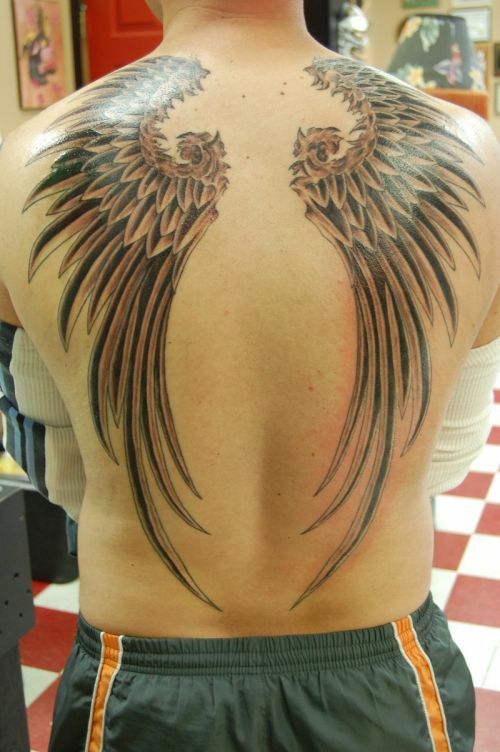 With two stylized wings emerging from without you, this exquisite back tattoo will remind you of the angel within. Each feather is detailed, and the design itself is beautiful in black, contrasting wonderfully with the skin. 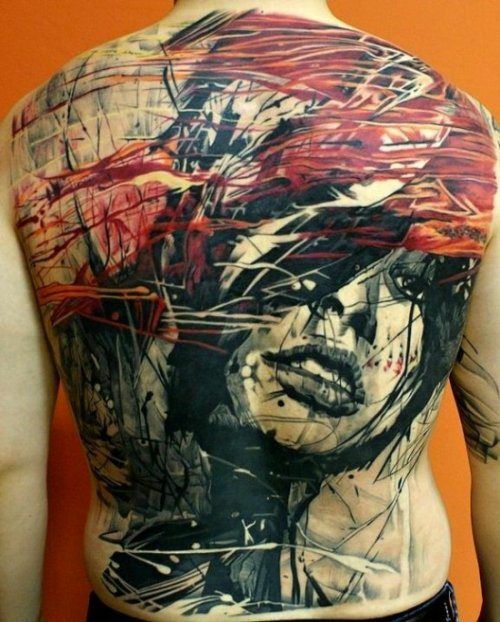 As far as back tattoos go, this one is a beauty. Covering up all of the back as well as the back of the arms, the awesomely designed and detailed skull is guaranteed to make you stand out. You can see the detailed additions on the arm as well, from the Star of David to the vampire teeth. Moreover, the patch of red on the upper arm forms a sharp contrast to the black which dominates the rest of the tattoo, adding color to the otherwise morbid imagery. Nothing can beat the powers of a wizard. 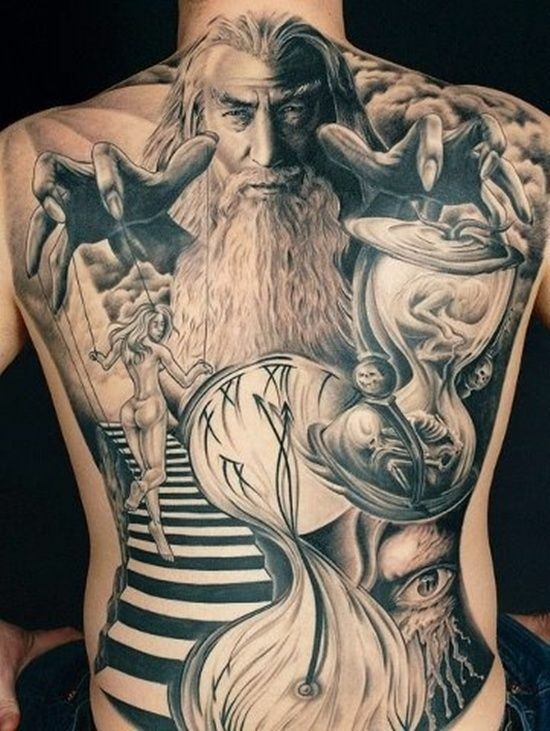 With a very life-like Gandalf playing the puppeteer, this tattoo brings the magic to life. Entirely in black, the collage turns your back into a bewitching scene. 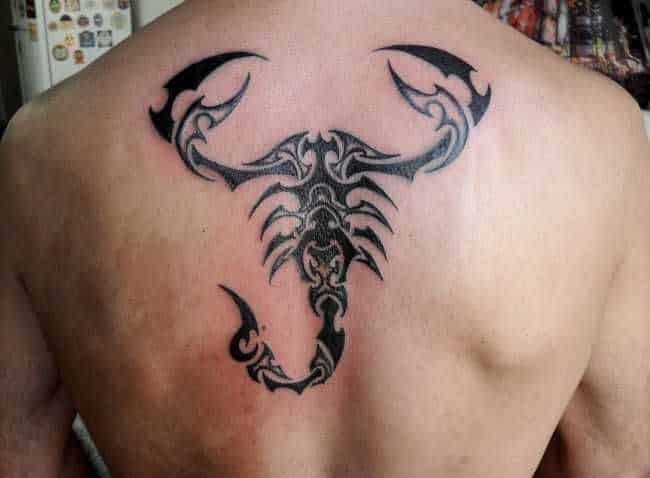 This stylized scorpion centered on the back looks incredible. With black and blank shapes, the skin provides an incredible contrast. Moreover, the bold lines truly bring this creature to life. This eye-catching design is sure to turn heads. 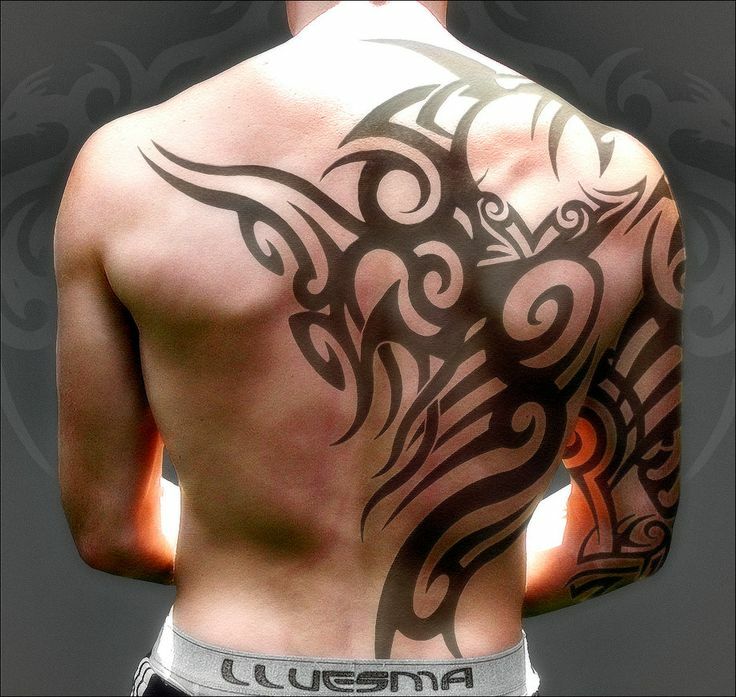 Covering the shoulder, arms, and a side of the back, this is a great idea for men’s tattoos. The bold lines as well as the strong curves give it a very macho appeal, kind of like Mike Tyson’s face tattoo.